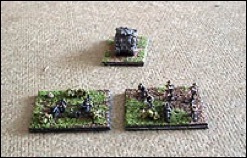 Crossfire uses bases (typically 1.25" (30 mm) square) to represent infantry squads. Although simple flat squares could be used, like in a board game, most gamers add figures, scenery, etc. People use a variety of figure scales, depending on their particular preferences. 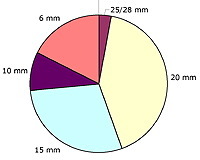 The figure scales used range from 2 mm to 28 mm (see pie charts). Pie chart of popularity of figure scales. Data from poll of subscribers to Crossfire-WWII@yahoogroups.com, closed on 30 June 2005. Pie chart of popularity of figure scales. Data from poll of subscribers to Crossfire-WWII@yahoogroups.com, closed on 26 May 2003. 25 mm scale. Sherman, HMG and rifle squad. Bases are 40 mm square. Airfix models. 6 mm scale. Sherman, HMG and rifle squad. Bases are 30 mm square. 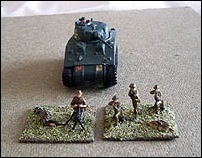 GHQ models. Used by many, with one figure representing 2 or 3 soldiers. This gives three or four figures to a squad, and sometimes necessitates increasing the base size to 40 mm or so. A typical HMG base would normally have two figures and one HMG (rather than the two HMG teams the base represents in the game). Some gamers using larger figures modify Crossfire such that a base represents a fire team rather than a squad. Thus each squad is represented by two bases, a LMG team, and a rifle team, plus a squad leader. This allows the figure scale to be 1 figure = 1 soldier. See Lloyd Nikolas's web pages for details of this approach, and some fine photos of figures. Quite a few gamers use 6 mm figures. I opted for the standard squad bases, with a 1 figure = 1 soldier scale. So a HMG base has a couple of HMG teams on it, and a squad has about 6 figures (representing an under strength squad). See this page for examples of how I base figures. Another option is to use a basing scheme similar to that used by the larger scale gamers, and reduce the base size correspondingly (a 40 mm base size at 20 mm figure scale would be scaled down to 12 mm at 6 mm figure scale). This has the advantage that a typical gaming table also scales down from 6 foot x 4 foot to something like 2 foot x 1 foot. Hey, you can play solo wargames on your lap, whilst watching TV! I have little information about these scales. Perhaps these offer the best of both worlds! Please send me some information or web links and I'll add in some more details.